Here are some links to screencam demos, previous posts about FlexSpaces (both Flex+Browser and Flex+AIR), an open source RIA client for Alfresco ECM (and for Adobe LiveCycle Content Services ES too). 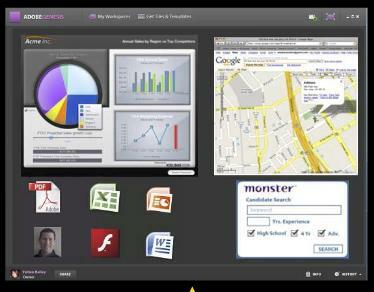 FlexSpaces has many features including multiple views (icon/thumbnail/grid/coverflow), doclib, search, workflow, and wcm. The AIR version has desktop native drag/drop/clipboard support. These clients also have UI (auto-tagging, tag suggesting, geo-location tag google map) for the Alfresco Calais integration. FlexSpaces uses Cairngorm and has been refactored to use the presentation model pattern. Additionally, prototype work has started on FlexibleShare, which leverages FlexSpaces components in an open source Flex based portal container / dashboard with Flex based pods for open source enterprise software (Alfresco ECM, Alfresco Share, reporting/BI, BPM, Liferay portal backend) and also LiveCycle. Also plan to enable the pods to be used as Adobe Genesis Tiles. Adobe is going to give more details about Genesis, their enterprise / collaborative / mashup AIR client next week at Adobe MAX. This client is supposed to be a free download with for pay SAAS collaborative services, and have an app catalog. Although I assume it won’t be open source, I am curious how open and flexible it will be. Can it be used as a general flex based portal container? Can you customize the container or only just plug in Tiles? What apis will it have? Could you use it without their services and tie in your own SSO ? I could do the portlets for the FlexibleShare project I have started on as Genesis Tiles (for Alfresco ECM, Alfresco Share collaboration, open source BI/reporting, etc). Maybe also have an open source Flex portal container supporting the Adobe Genesis Tile api (and support both Flex+AIR and Flex+Browser containers. Note: html embedded in Flex works best in AIR). I have been prototyping using the Esria dashboard sample as a Flex based container with FlexSpaces components in pods (Alfresco DocLib, Search, Tasks, WCM). It works in AIR including drag/drop of desktop files into FlexSpaces pods. The DocLib and Search pods also support Adobe LiveCycle Content Services ES. The Alfresco Share UI works in this prototype currently in an HTML pod. I will be starting Flex versions of the Alfresco Share collaboration components (wiki, blog, calendar, discussions). Also have a JasperReports viewer pod based on a modified version of the flex based JasperReports flash viewer. 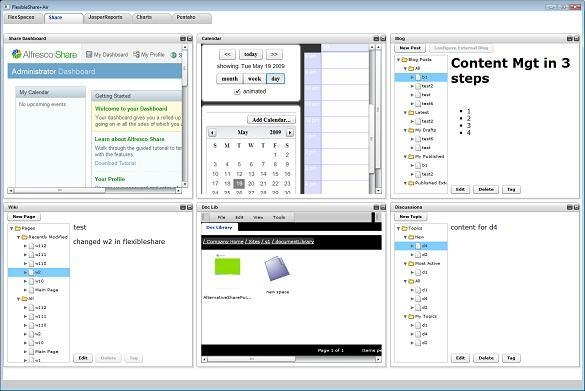 There is also a Flex based Pentaho dashboard sample available. BIRT reports could be viewed as html or pdf, or with the Actuate interactive viewer. The open source Anvil project (Flex MDI portal / Java backend framework) could be leveraged. Also found an interesting article about Flex based portals: “A new way to look at Portals“. Note on the name: Alfresco Share and Surf are already “flexible” (in the able to adapt to new situations sense). Also you can implement Share/Surf components/dashlets with Flex (as I did with the FlexSpaces page site components). The difference with FlexibleShare is that the container itself is in Flex and the primary way for implementing dashlet/portlet UI is Flex (and Flex+AIR). Surf dashlets and Liferay portlets in HTML/Ajax are still supported. Other things: the use of a web-tier Flex compiler (like the Flex plugin for Grails does) could be used to allow Flex forms/UI to be added (and compiled automatically) without having to use a development tool. BlazeDS support like in this plugin would also be nice too for higher performance data transfer. Update: See description of FlexibleShare prototyping mentioned in my Genesis / Flex Portals / Open Source blog post.